Insta360 One X battery charger cradle: Does it work? Is it worth It? This is a review of the Insta360 One X battery charging cradle, which promises to charge up to two batteries in half the time it takes to charge one battery with the camera’s internal USB charger. Does it really work? Is it worth getting one? Although Insta360 One X (reviewed here) is the best consumer 360 camera at the moment, one of its weaknesses is the somewhat short battery life, which is around 45 minutes of real-world shooting. Fortunately the battery is removable, and you can get spare ones. The Insta360 One X battery charger cradle is an accessory for the One X that can charge two batteries at the same time. It also charges the batteries twice as fast as the internal USB charging with the camera itself. With two batteries, it is effectively four times faster at charging. I ordered one to see how well it really works. The cradle comes in a package that includes a Micro USB cable and a USB charger. The charging cradle has very good build quality and has a smooth matte finish. Each slot has an LED light. The first time I tried the charger, I just plugged it to my USB hub. It took a while to charge the battery — about as long as the internal charging of the camera. Moreover, when it seemed that the battery had been fully charged, the LED light would flash red and green, instead of staying green. When I inserted the battery in the camera it said “Low Battery.” I thought my battery was defective but when I charged it with the Insta360 One X USB charging, the battery worked normally. I talked to Insta360 about it and they suggested using the original cable and USB adapter. I tried it and this time, it did work correctly. I timed how long it would take to charge a fully depleted battery, and it was able to top it off in 52 mins. I’ve since been using it without any problems whatsoever. The Insta360 One X charging cradle does work as advertised, charging up to two batteries in half the time it takes to charge one battery with the camera’s internal USB charging. Just make sure you use the original USB adapter and cable included in the package. It’s somewhat pricey but it’s an accessory that you’ll be using again and again. I do recommend getting one and a spare battery to ensure you’ll be able to use your Insta360 One X throughout the day. Can you review their “cold” battery next? And shouldn’t the cold battery simply become the standard battery if the capacity is the same? Is it safe to use the cold weather batteries in warm weather? Hey, thanks for the useful article, what other good 3rd party batteries are available for this camera? Hi Isaac. I don’t know of any 3rd party batteries for one x. maybe in the future? The red-green flash is caused by non QC3.0 chargers. 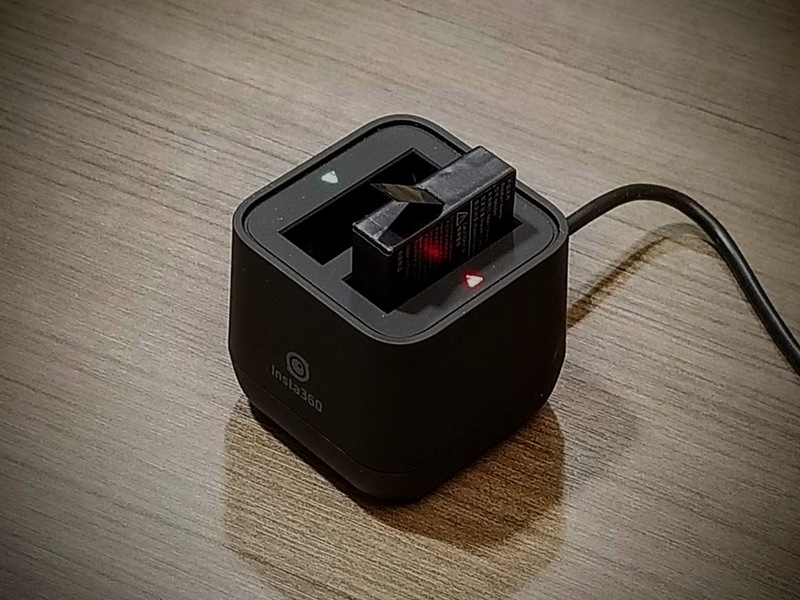 The cradle ONLY works with Qualcomm QuickCharge 3.0 chargers / battery packs. Thanks Pedro! I really appreciate it! It does not mention 9 volts 2 amp requirement. I bought the charger and I’m having an odd problem. When plugged in, slot 1 flashes red/green, slot 2 is solid green. This is with NO batteries inserted. If I put the one (and only) fully empty battery I have (can’t buy extra batteries anywhere at the moment) into slot 1 it turns to red and charges. If I put the battery into slot 2 it turns to green. Also, I’ve found that if I keep the battery in the camera, it’ll drain completely after about a week. So I’ve taken to storing the battery outside of the camera. All in all, this seems very much like it’s a 1st generation device (and system).